Microsoft's Mesh seems full of promise, even if you can't find a jargon free definition of it anywhere, even Microsoft: All your devices working together; Access from Anywhere, Simple to Share; Stay Informed; Protection You Know. Let's stick with the simple here and now: It's online file syncing, sharing, and storage for many devices. And Windows' existing remote desktop software is thrown in. At its best, Mesh should be as simple as the diagram above implies, but other screenshots and the 25-minute tour video below show it to be much more complicated. Why is this the case when file sharing and sync has had the potential to be transparent and automated as on .Mac and Zonbu's systems? • Micromanage the sharing of folders and files to other machines and to an online storage center. • Share those files with others. • Do some through the window remote desktop wrangling via client or even a web browser. • Stay updated when people add or alter files or accept share invites. It's hard to describe it beyond that level of granularity at this point because it isn't exactly a clean solution for "All Data, Everywhere". For example, it is missing a huge chunk of what people need sync for, sharing of contacts and calendars and bookmarks across diff OSes and Apps. And sharing files is not the same as sharing info. What I mean is, it's less important for me to share files across machines, which I can do with a USB drive or FTP server or .Mac as a Mac user, and more important for my address book to be in step across my machines. (Without resorting to Exchange.) I hope this comes along in a future version, but it seems really strange to launch Mesh without even attempting this, even as a tech preview. Currently, it seems like tech for tech's sake. Or at least a useful system that is a little overhyped. 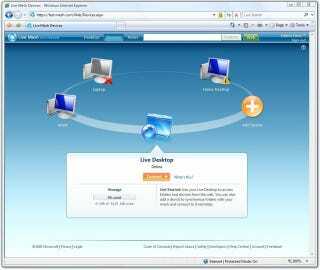 "Live Desktop and Live Remote Desktop. While the two have similar names, each does something different, but both add amazing conveniences. Live Desktop enables you to easily access your mesh anytime, anywhere, using only a Web browser." Seriously, why name them so similarly?! Messaging is one thing, but usage, man. For such a simple feature set, it shouldn't take 25 minutes to explain. Try watching this vid (sorry, Silverlight required), which uses phrases like "To Live the Mesh Lifestyle." They even have a simpler video for dumb students. Yay, only 16 minutes long, on Channel 8 (their student dev site, where the host waves his arms a lot and has to stop himself from saying "yo"). So, jargon and buzz aside, the major roadblock here is complexity. Again, this build is super simple. So how long are the tutorial videos going to be for expanded versions? An hour? Sharing your files shouldn't be so laborious to explain or do in theory or practice. I mean there is huge room for improvement here in terms of simplicity. Sync is one of those things the machine can completely handle and figure out when mapped right, and user intervention can be limited to micro management and conflict resolution.